It’s true, you either love it or you hate it. 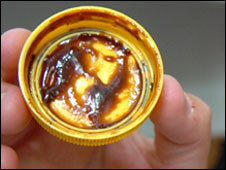 It seems that the face of Jesus has moved from normally appearing on toast to appearing on Marmite lids. Jesus has also been known to make an appearance on steamed up bathroom mirrors, moldy walls and camera flash reflections in glass. Good news for the faithful and good news for Marmite who can expect a modest sales boost at no advertising cost to themselves. Also good news for atheists like me who find such things ridiculous in every sense of the word. It made me laugh but not in a charitable or self depreciating way. Just for the sake of arguing, the “face” of Jesus isn’t actually Jesus and in no way provides any evidence of divine intervention. No miracle has occurred. What we have here is a person seeing a pattern in Marmite and associating it with a popular image. Humans are very good at recognising patterns. I’m almost sure that this can go unsaid but for news stories like this that indicate that some people just don’t get it. Besides which I’m pretty sure that Marmite isn’t even in the bible. Personally I think it looks like Ozzy Osbourne. A bit of context first. His Holiness the Dalai Lama was honoured by the Florida school in 1999 with a doctorate of divinity so he has a personal interest in the welfare of the school. However I believe that this has only highlighted the financial issue with him rather than defined his reaction. I’m a bit biased of course because his writings portray him as a person with few material desires and little regard for considerations of status. In a largely material western world this is unusual. His reasoning for this support is outlined in a letter to the university president where he said that “understanding and appreciation of diversity of religions is critical in fostering a culture of genuine tolerance and peaceful existence.” A laudable sentiment that crosses boundaries of faith and fosters cooperation and compassion. Some may wonder how my support of this can be reconciled with my dislike of state funded education by religious schools. As I explained in the comments I see a clear difference between education about religion and education by religion. Tenzin Gyatso, the current and 14th Dalai Lama is supporting a cause that educates people about religion and about culture that is intertwined with religious thinking and expression. He is not supporting a cause that churns out pastors or monks (although people might choose that path) by indoctrinating people into a faith. The key point here is that he has chosen to support an attitude of understanding and cooperation rather than supporting dogma. He has chosen not to put his own view of Buddhism ahead of Christianity or Islam but to foster an attitude that encompasses all faiths and, dare I say it, no faith. I read the above story with interest this morning. It seems that the French are happy to fund faith schools for Christians but not for Muslims. Quite why they (or any other nation) fund faith schools is beyond me. Shouldn’t the faith of people be a personal matter? Shouldn’t faith be separate from state interference and support? Can’t we leave religion alone and expect it to leave us alone? Why should we expect schools to indoctrinate children into a faith at all? That said, if you have one rule for Christian or Catholic (I know they’re Christian too) schools then that rule should apply to Muslims, Buddhists, Baha’i, Hindus, whatever. Shouldn’t it? Sharon has given birth to three little guinea pigs that look a lot like their dad, Ozzy. I’ll try to get some pictures later or maybe even one of those newfangled moving picture things. What names should Ozzy and Sharon’s babies have? We’re thinking that the obvious Amy, Jack and Kelly are appropriate if there are two girls and a boy.